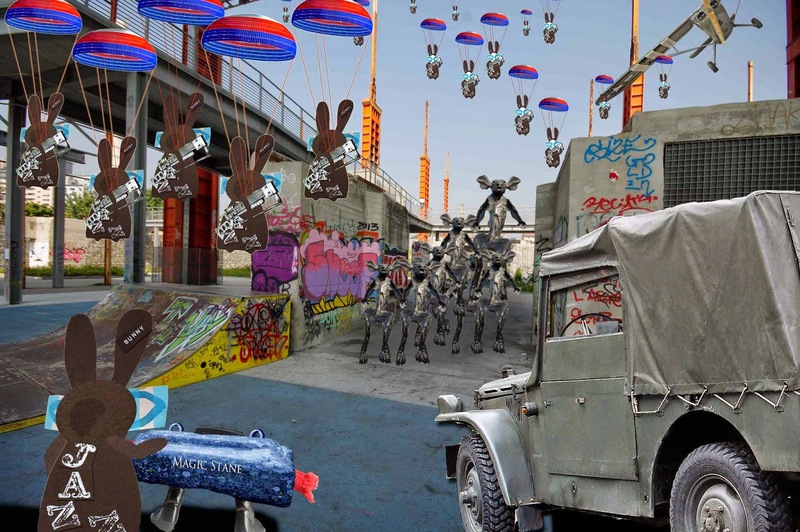 The Wabbit drove swiftly to a place he knew well, with the Agents of Rabit in hot pursuit. The Stone kept looking back. "They seem a wee bit annoyed," he said. "Unfinished business," said the Wabbit. He made a series of sharp turns, doubled back and for a moment it looked as if he'd lost them. Then he span the steering wheel and hauled on the brake. The jeep screeched sideways into an alleyway and stopped just short of the lead group. "What now?" asked the Stone. "We get out," said the Wabbit. The Agents stopped as they always did and shouted death threats. But before they advanced they couldn't help spitting and and howling insults so the Wabbit nudged the Stone to prepare him. "Your fur is a disgrace, Wabbit." shouted the biggest Agent. "Who cut it?" shouted another, "the fishmonger?" "They need a seein' to," muttered the Stone. "They're going to get one," advised the Wabbit and he twitched both ears. "I can hear a plane," said the Stone. Suddenly the air was thick with parachutists as all 400 of the Wabbit's private guard came tumbling from the sky. The Stone smiled - insofar as he could smile. "Hell's teeth son, whit are these?" Snazer fire and painful cries echoed across the walkways. "They are the 400 Rabbits." grinned the Wabbit. "I think this dance is oors," said the Stone.